Are There Any Statues Of Living People In London? Harry Rosehill Are There Any Statues Of Living People In London? There's a standard route to getting yourself a statue in London. Do something worthwhile with your life, then kick the bucket. You're sure to be honoured posthumously. Logic probably dictates that it's a little too much for one's ego if you had a statue of oneself unveiled while living. Except for this select group who were deemed worthy enough that sculptors just couldn't wait for their death. Arsenal's stadium The Emirates hasn't exactly been a rip-roaring success. Maybe that's why they decided to garner some more enthusiasm about it by honouring some club legends with statues. 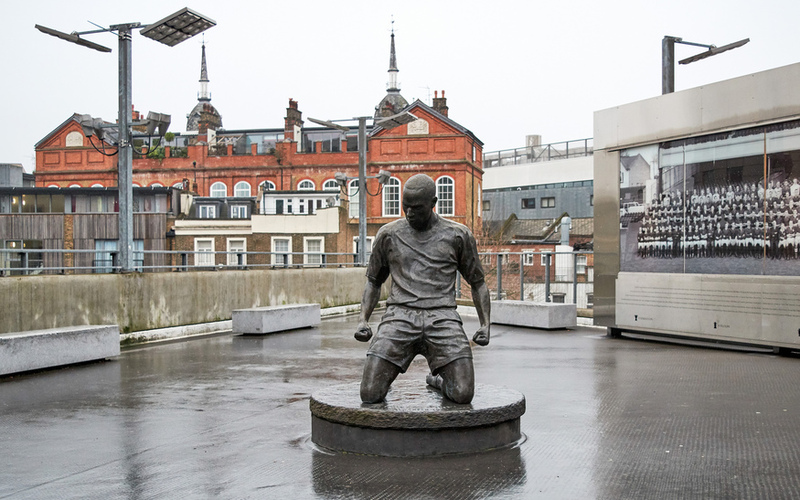 In 2011 they unveiled statues of Tony Adams, Thierry Henry and Herbert Chapman outside the stadium. In the years following they added Dennis Bergkamp and Ken Friar. All bar Chapman are still alive. Even if you're not an Arsenal fan, we'd recommend taking a look at Friar's statue if you're in the area. It has him as a schoolboy kicking a football and inspires just the right amount of childhood nostalgia. It really seems like a sure fire way to get yourself a statue in your own lifetime is by becoming a top tier footballer. The nation's pastime was — shockingly — once a point of national pride, when England won the World Cup in 1966. Three members of the cup winning team played for West Ham, so in 2003 the club unveiled a statue of them (and one more player). The talented men in question are Bobby Moore, Geoff Hurst, Martin Peters and Ray Wilson. 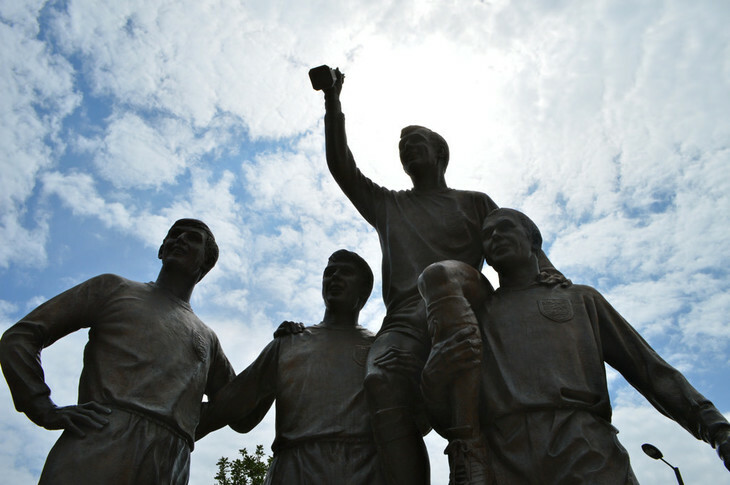 All the men except Moore were alive, to see the statue take its place outside Upton Park. When West Ham made the fateful move from the Boleyn to the Olympic Stadium there were plans for the statue to come with them. However, Newham council weren't thrilled at the prospect of losing the statue, so plans have stalled. It might still move, if someone coughs up some money for improving the road junction it sits on, or a piece of art to replace it. 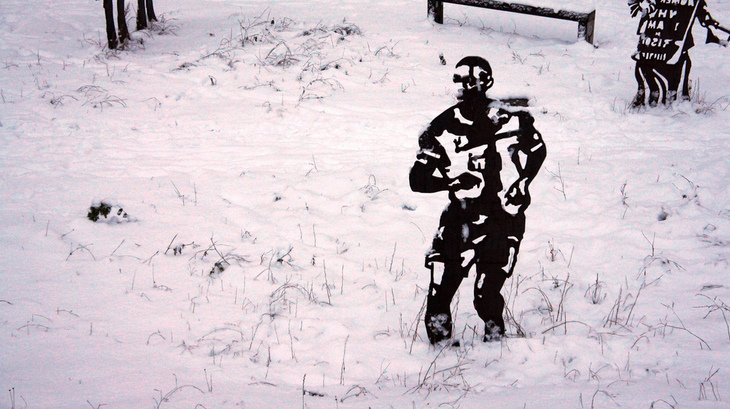 Perhaps it could be another statue of a living person? Michael Bond stands proudly holding his most famous creation, Paddington Bear. Where's the statue you ask? Why next to the Paddington Basin of course. This is part of the Sustrans' Portrait bench series, a self-described national social-history project. 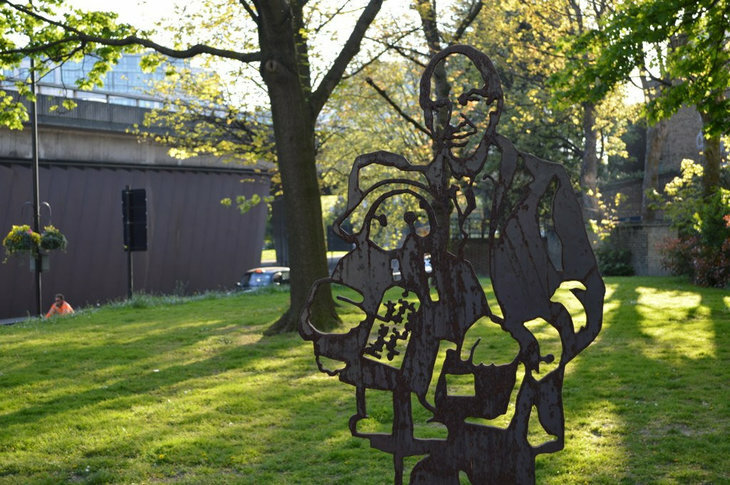 Communities nominated people who'd made a worthwhile contribution to local life to be honoured with a laser cut statue. They're somehow supposed to promote cycling but what's important to us is that a few of them are living, so let's rattle them off. Master cockney actor Michael Caine is out on Brunswick quay in Rotherhithe. Then there's brilliant Tottenham centre-back — yes, another footballer — Ledley King in Mile End Park. Curiously he stands next to Sylvia Pankhurst. Now there's a buddy cop movie we'd like to see. Then outside Finsbury Park station there's the soul and funk master Jazzie B, the founder of Soul II Soul. A touch further north in Downhills Park, London 2012 boxing gold medalist Nicola Adams stands proud. 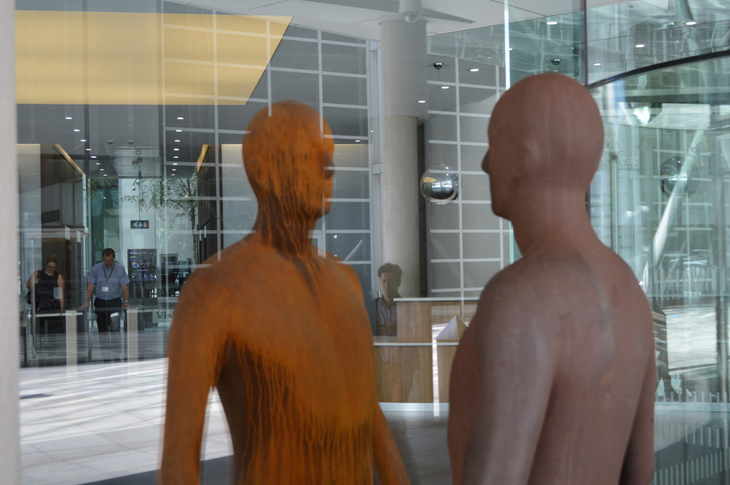 Antony Gormley has countless sculptures dotted around London and many of them are of himself. Perhaps it's a tad egotistical — no one else on this list made their own sculptures — but he's guaranteed himself a place on this list, so clearly it's worth it. Here's a guide to spotting him across the capital. We hear your indignant cries. Don't worry we haven't lost control of our senses. 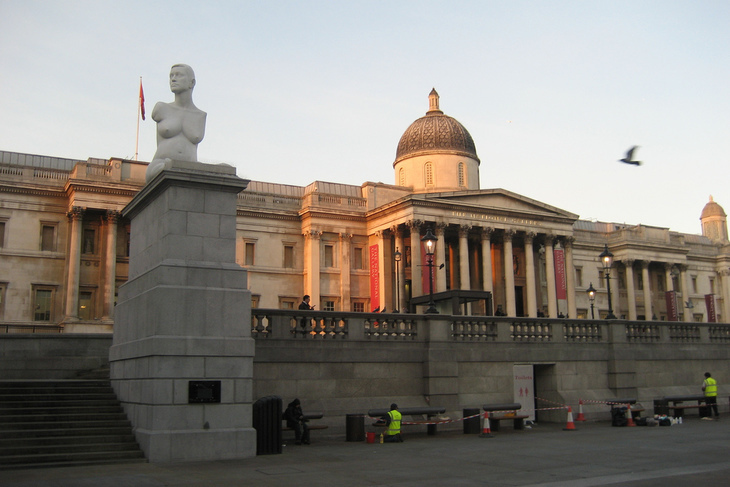 We know that Marc Quinn's statue of Allison Lapper is long gone from the Fourth Plinth, but what's a listicle without a sneaky bonus one. It was the longest resident in the plinth's history, and is so well known we felt it worthy of inclusion. And Alison is very much alive today. The above aren't the only people to have a statue in London unveiled during their lifetime. However everyone else who received the honour is now dead. Our friends at London Remembers compiled a handy list. They've missed two royals out by our count — but we'll forgive them — Queen Anne at Queen Anne's Gate and Queen Victoria outside Kensington Palace. It's also worth pointing out that Nelson Mandela got not one, but two statues in London before his death. If you think we've missed any out, let us know in the comments.